Mémoire d'Encrier: Dix ans de livres et d'amitiés! De l'iPad au Nokia en passant par l'iPod et le MacBook Pro: Vive la lecture! La religion "numérique" avec La Croix et Cyberlibris! We've just added two new widgets to the Netvibes ecosystem. 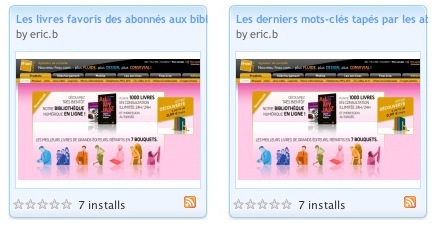 These widgets relate to the brand new service we have co-developped with FNAC. The first one tells you which books are added to their personal bookshelves by FNAC subscribers. The second one yields the keywords that are typed by subscribers to launch their searches. Information is a crucial asset that deserves to be managed like any other valuable asset. Information is not any kind of asset though. For instance sharing relevant information is more easily said than done. Moreover information cannot flow seamlessly without the support of dedicated technologies. This book takes with success the challenge of walking the reader through the modern use of information systems in corporations. "My colleagues and I have found that most MIS books focus more on the components of information systems or on their strategic use - and they miss the middle (management) ground entirely. "Managing and Using IS" covers the basics only in brief. It then devotes itself to key, mid-level, management issues most important for understanding the IS organization, its components, and associated issues. This book goes into greater detail than other MIS books. This is a basic book and quite an asset to students struggling to learn about IS organizations and their management...this book will not disappoint." Keri Pearlson, DBA, is the founder and CEO of the Zero Time Institute and Founding Partner of KP Partners. She served as a faculty member in the well-known Information Management Program at the University of Texas at Austin, Graduate School of Business. Dr. Pearlson has worked with executives at many e-business startups and with managers at several Fortune 500 companies, including 3M, General Motors, FedEx, AT&T, Dell, and Cisco. Dr Pearlson has been promoting the Zero-Time concept. To get more familiar with the concept here are a zerotime-white_paper.pdf and a Dell_case_study.pdf . editorial review board of Information Systems Research.